How does Continuous Ink Supply System (CISS) work? CISS (Continuous Ink Supply System) - it's a system which enables to decrease expenses when printing with inkjet printer, МDF or plotter. СISS consists of three parts: ink tanks for ink, cartridges similar to original, ink tube to connect cartridges with ink tanks. The essence of CISS: ink is being added from ink tanks to the cartridges during printing process and then it passes through the printing head to the paper, so you do not need to buy cartridges every time ink runs out, ink is constantly being added from ink tanks. Usually the economy of using CISS is about 95%, so you save $950 from each $1000 you would spend on original cartridges. How can I refill CISS? For refilling you can use ink tanks of 100, 500 or 1000 ml depending on volume and printing format. The retention period of ink – 3 years from the moment of production (indicated on the label). To refill CISS, just open the rubber stopper from the filling access port and add ink of required color. In general, this process can be compared to refilling petrol in a car. Original cartridge usually contains 8 -11 ml of ink (20-40 % of it is not used at all, read the article «Inkjet printers are filthy, lying thieves»). СISS contains 130 ml of each color: 100 ml in tanks and 20-30 ml in the ink tube and cartridges. As a result you will need to fill CISS 12-13 times less than replacing original cartridges. What advantages will I receive when using СISS and Refillable cartridges? Saving money. By using CISS the cost of one print decreases by 20-30 times, or 1000-1500 %. You can easily calculate economy independently. For example, to fill 95 % of a paper sheet (A4 format) about 1 ml of each color is needed. Cartridges contain about 10 ml of each color. 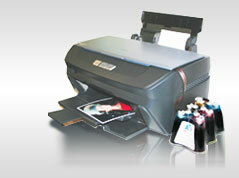 For example calculate the cost for 100 sheets using original cartridges and ink from «INKSYSTEM». Benefit is obvious. Improvement of printing stability. Each time when you remove a cartridge from the printer, contact of the printing head with air takes place, which can lead to printing quality deterioration. By installing CISS, you insert cartridges once and use them without any problems. Increase of printer productivity - 25 %. Now you can choose ink for different kinds of printing purposes: Dye Ink, Pigment Ink, and Sublimation Ink. All depends on what you are going to print (glossy paper, fabrics, metal, and wood). So you receive new possibilities which were not envisioned by the manufacturer of your printer. Now you do not need to take out cartridges from the printer, printing head does not contact with air and therefore your printer functions much longer. There is no INKSYSTEM representative in my city, can I install CISS independently? Yes, certainly. CISS installation does not take a lot of time and does not require any constructive changes to the printer. In general, installation consists of the following: original cartridges are removed from the printer, instead new cartridges are installed, connected to CISS by the ink tube, and ink tube is connected by clips. Download instructions on Continuous Ink Supply System (CISS) installation or Refillable Cartridges (RC) in "Instructions" section. What difference in quality in comparison to original consumables? Usually the difference in printing quality is 3-5 %. In order to make printing quality better please order individual ICC profile or use standard color rendition which is available here. How long can I use the set of ink (130 ml of each color) ? Usually the set of ink suffices for 2000 photos (10*15 format) at 95 % page filling. This quantity can decrease and increase, depending on saturation and percentage of filled surface. Pay attention, manufacturers of printers usually cheat and indicate quantity of pages for about 5 % filled surface. In reality, it's only 3-4 lines of text, and as a result the quantity of printed pages is much lower. Whether warranty for the printer is saved with CISS installation? No. Printer manufacturers do not grant warranty for use of compatible consumables. At the same time, you save so much on printing, that even in case of problems with your printer (0,3-0,5 % of cases) you can easily afford paid repair. Usually printer problems are directly related to using poor quality ink and cartridge. Our employees can solve technical printer problems for additional payment. Much better to print cheaply, than to repair for free. CISS is suitable for which kinds of printers, MDF and plotters? For almost all kinds of printers, etc. Today we make СISS for 97 % of models of printers, МDF and plotters, manufactured over the last 5 years. Even if this item is not presently available, within the next several weeks we can acquire this model. See offered models and find required products in the online store. If you have not found the necessary model, please leave your inquiry in "contacts" section, we will answer your request. Usually dispatch occurs on the day of receiving payment. Delivery times depend exclusively on the method of delivery chosen by yourself and the transport company. I wish to sell INKSYSTEM products in my city. What should I do? If you want to begin cooperation with INKSYSTEM company and would like to open a representative office in your city, please fill in the form indicated in «How to start business» section, our managers will contact you.